Last night was a beautiful evening in Minnesota. A mild temp in the 30's and no wind, which is all pretty terrific for winter time here. 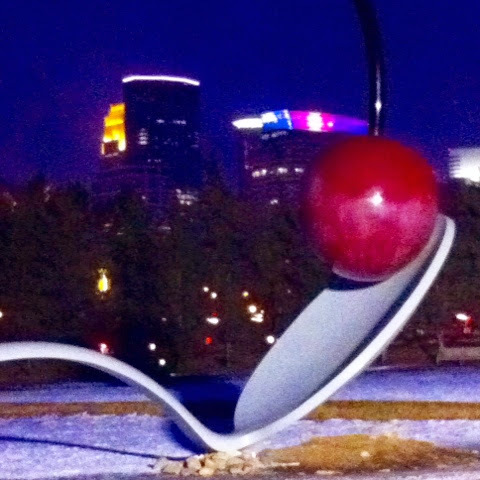 I've lived in Minnesota my whole life and have never seen the iconic giant spoon and cherry! This sculpture is pretty well known around these parts and often dubbed a Minneapolis symbol on tourist magazines and post cards. Located at the Sculpture Garden of the Walker Art Center, it's one thing to check off your list of things to see while visiting the city. It's funny, when I visited Chicago, I pedal pushed, power walked and train hopped to catch as many attractions I could crammed into 3 days. But, in my own city, it's taken until now to see this classic piece of flatware! After deciding to get out and enjoy the nice weather and finally check this out, I had no idea it was going to create a debate between Mister O and I. When I told him this was my first time here, he argued that "no we've been here together before!" "I brought you here before we were married." I responded with a resound, "no you didn't, that must have been your other girlfriend!" "No way, it was not another girl." I remember it was you that I brought here before!" Ya see, after being together a little over 20 years, I could understand where he might think it was me. However, I'm very confident that I'd remember if I had seen a GIANT spoon with a cherry on it. So, the debate ends, but not after Mister O found it very difficult to believe and causing a "he remembers, she remembers" park scene. Therefore, I'm going on record as saying...it wasn't me! I'm thinking, though, after this little outing, that I really need to get out more! It's my goal this year!! Also, I do believe "a square of chocolate" would be a good addition to the spoon and cherry. Funny! Maybe you and Mr. should take the class that teaches you how to paint the cherry and spoon to make it even more memorable. Nice to meet you at the conference. Actually that's a pretty good idea and I'm pretty sure my hubby would even enjoy that. Good meeting you as well and thanks for stopping by for a visit.